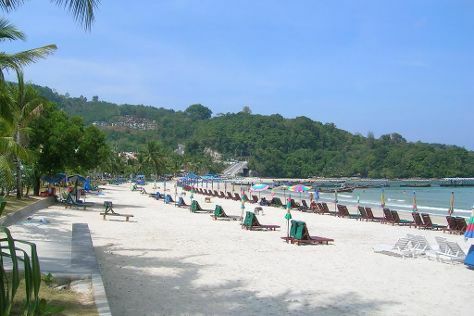 You'll visit kid-friendly attractions like Patong Beach and Nai Harn Beach. And it doesn't end there: kick back and relax at Kata Beach, take some stellar pictures from Karon View Point, make a trip to Bangla Road, and see some colorful creatures with a scuba or snorkeling tour. To see traveler tips, reviews, other places to visit, and other tourist information, you can read our Patong custom trip planner. Kiev, Ukraine to Patong is an approximately 21-hour flight. The time zone difference moving from Eastern European Time (EET) to Indochina Time (ICT) is 5 hours. Prepare for much warmer weather when traveling from Kiev in February: high temperatures in Patong hover around 38°C and lows are around 26°C. 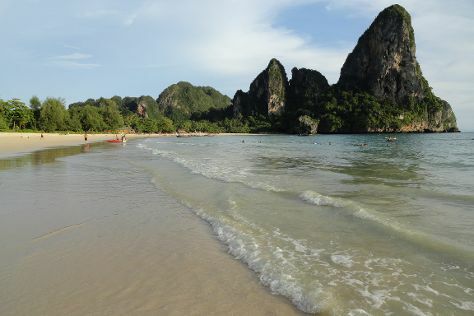 Wrap up your sightseeing on the 1st (Wed) to allow time to drive to Krabi Town. Kids will enjoy Phra Nang Beach and Tree Top Adventure Park Krabi. Take a break from Krabi Town with a short trip to Khlong Muang Beach in Nong Thale, about 32 minutes away. There's still lots to do: hike along Railay Beach, get great views at Railay Beach Viewpoint, enjoy the sand and surf at Ao Nang Beach, and stop by King's Fashion. To find reviews, maps, where to stay, and tourist information, you can read our Krabi Town tour planner. Traveling by car from Patong to Krabi Town takes 3 hours. Alternatively, you can drive; or do a combination of ferry and bus. Expect a daytime high around 40°C in March, and nighttime lows around 26°C. Finish your sightseeing early on the 3rd (Fri) so you can travel to Chiang Mai. On the 4th (Sat), surround yourself with nature on a nature and wildlife tour. On the next day, admire nature's wide array of creatures at Chiang Mai Zoo, relax and rejuvenate at some of the top local wellness centers, and then explore the ancient world of Wat Chedi Luang Worawihan. For maps, other places to visit, reviews, and other tourist information, refer to the Chiang Mai trip generator. Traveling by combination of bus and flight from Krabi Town to Chiang Mai takes 3.5 hours. Alternatively, you can drive; or take a bus. In March in Chiang Mai, expect temperatures between 41°C during the day and 24°C at night. Finish up your sightseeing early on the 6th (Mon) so you can travel to Bangkok. Bangkok is known for religious sites, shopping, historic sites, sightseeing, and nightlife. Your plan includes some of its best attractions: contemplate in the serene atmosphere at Wat Pho, get in on the family fun at Safari World, explore the historical opulence of The Grand Palace, and get a taste of the local shopping with Chatuchak Weekend Market. For traveler tips, ratings, more things to do, and tourist information, go to the Bangkok trip itinerary builder. Getting from Chiang Mai to Bangkok by flight takes about 3 hours. Other options: drive; or take a bus. Plan for somewhat warmer nights when traveling from Chiang Mai in March since evenings lows in Bangkok dip to 30°C. Finish your sightseeing early on the 8th (Wed) to allow enough time to travel back home.